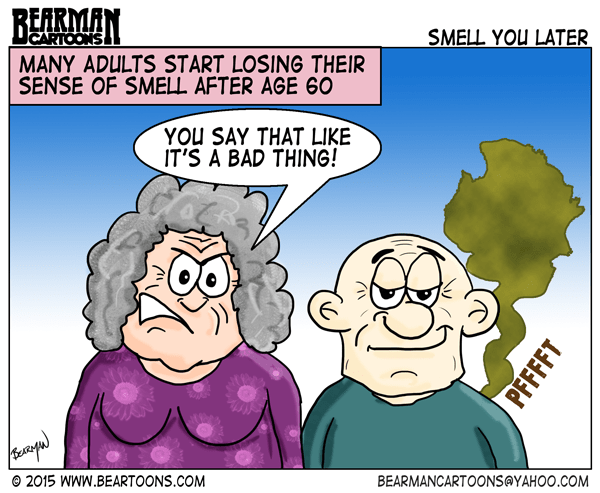 It is a known fact that we can lose our sense of smell as we age. Especially after age 60, the decline can begin in earnest. Sometimes your sense of taste can also diminish greatly along with your sense of smell. My mother and father in law (neither looking anything like the depiction above) are living proof. From an early age my MIL’s sense of taste and smell were very limited. For her that is a curse and a blessing. For the rest of us, it is simply a curse as she doesn’t know that sometimes she needs to air out the house because of my FIL’s farts. In her case this is a good thing. Bless her heart. And his heart too. It’s a good thing for her that she couldn’t smell his fart. Boy, there really is nothing to look forward as you get older… I just had to start using readers when I paint! Quit painting so much detail and you don’t have to worry about it. I have the unfortunate opposite effect because I quit smoking 3 years ago which has greatly improved my sense of smell & sense of taste. Hubby’s farts are so much stronger now too! How long before there is an app for that? I don’t think I can smell the garbage as much as I use to. Smell and taste are very much linked, so if you lose one, the other is likely to diminish as well. Might help with your diet, though. Huh. In all seriousness, I did not know that. My wife insists I have no sense of smell even now, so this could really bode ill for me. So that’s why older couples don’t murder each other!